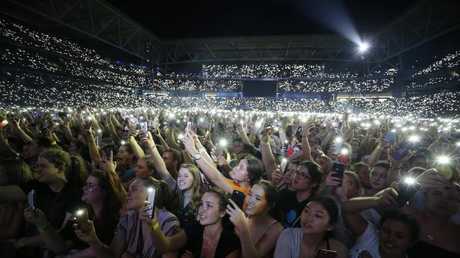 NOT even a packed out Suncorp Stadium could make Ed Sheeran seem small. Armed with nothing but his winning guitar and loop pedal combination, the British superstar refused to be swallowed by his surroundings at the first of his two sold-out Brisbane performances. The 27-year-old's impossibly powerful show kicked off with recent chart-topper Castle on the Hill before the singer paused to explain his technique and stress everything was "completely live". "I got accused of lip-synching once," he said. Sheeran sung hits including Eraser, The A Team and a mashup of Don't and New Man. Encouraging fans to get over their "irrational fear" of being judged while having fun, he said: "For God sake, do not let anyone you haven't met stop you from having fun tonight. If you feel like dancing, just dance weird, man." The crowd was mesmerised as a sweaty Sheeran passionately delivered Dive, Bloodstream and I'm A Mess as well as slower tune Happier. There was also a special one thrown in at the request of a young fan he met in Brisbane - Supermarket Flowers - which he performed in place of his usual Lego House. "I don't usually sing this one because it's too sad," he said. If Sheeran's crowd wasn't already completely smitten with the charming crooner, the combination including Photograph, Perfect and Thinking Out Loud certainly won them over. He finished strong with Sing before a screaming crowd enticed him back out for an encore of Shape of You and You Need Me, I Don't Need You. There was an ocean of hands in the air swaying back and forth or clapping during the final two songs, signalling the enthusiastic audience's reluctance to call it a night. But with a final "thank you", Sheeran disappeared from the stage. 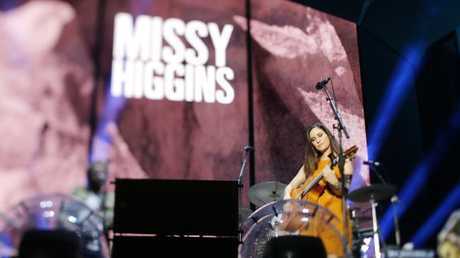 Missy Higgins performs in support of the British pop superstar. Sheeran was supported by Australian singer-songwriter Missy Higgins. 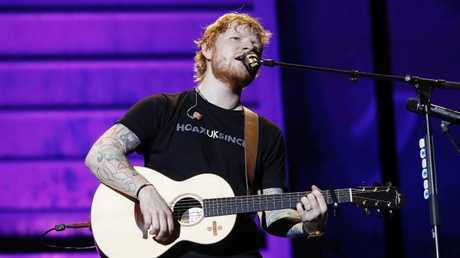 He performs his second sold-out show at Suncorp Stadium on Wednesday night. 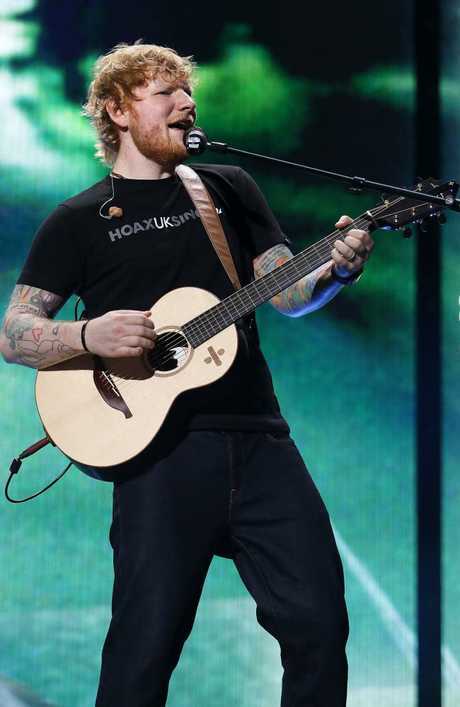 Brisbane is Sheeran's last stop on his Australian tour, with the star having previously performed shows in Perth, Adelaide, Melbourne and Sydney. John Gambaro with Ed Sheeran in Brisbane. Picture: Instagram. EARLIER: ED Sheeran forked out a cool $6000 on food and drinks at a much-loved Brisbane restaurant. The British superstar and his entourage dined in a private room at Gambaro Seafood Restaurant last night ahead of his two sold-out shows at Suncorp Stadium. According to a source, the party of 10 ate a meal of barramundi and prawns while sipping on Penfold Grange, which cost about $1000 per bottle, with the bill totalling about $6000. Staff at the venue sang the musician's praises, saying he was "really nice". 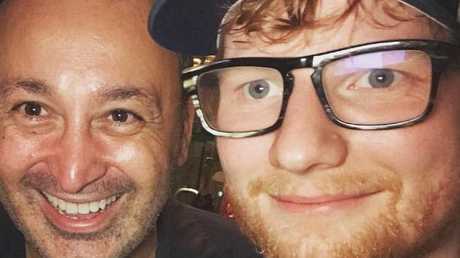 Sheeran, who is set to perform at Suncorp tonight and tomorrow night, also took time to snap a selfie with Gambaro Group managing director John ­Gambaro. Gambaro shared the picture on his Instagram account, calling Sheeran a "top bloke". "Great to have Ed Sheeran at Gambaros tonight," Gambaro wrote alongside the shot. "What a treat. Top Bloke." When contacted by The Courier-Mail, Gambaro did not want to reveal specific details about Sheeran's order but said they served him "fresh Queensland seafood". 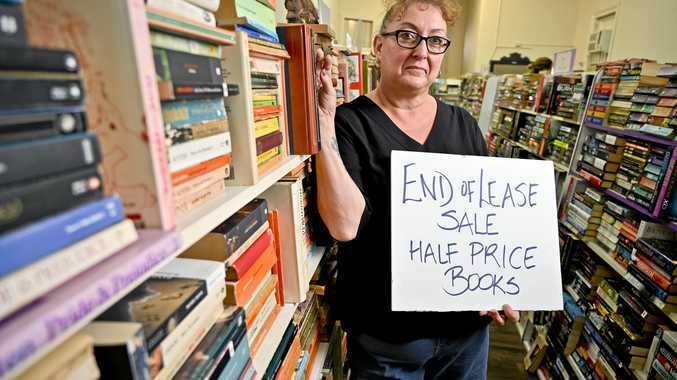 "He came in with a group of friends and was very polite," Gambaro said. "What was amazing was that he took the time to speak to all the waiters and people coming through and he was very engaged and very humbled. "It's very easy to see why he's a superstar - he was excellent (to deal with)." Gambaro Seafood restaurant has become a celebrity favourite over the years with the likes of Orlando Bloom and Manny Pacquiao dining there in the past. 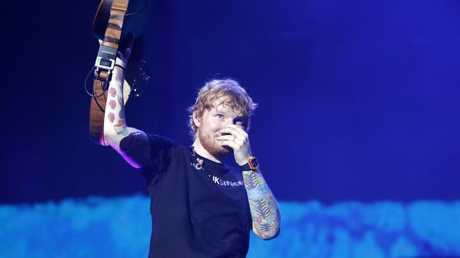 It comes after Sheeran rewarded diehard Brisbane fans camped outside Suncorp Stadium with a meal that even catered for their dietary requirements. 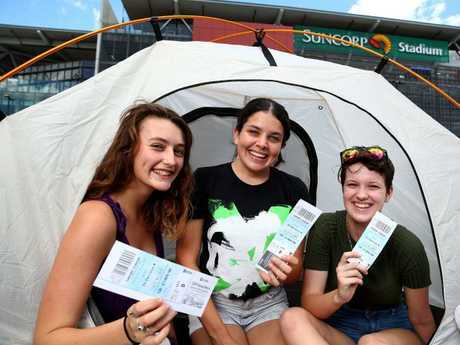 A handful of fans with freestanding tickets began camping out at the venue on Saturday in the hope of nabbing positions as close to the stage as possible and, on Sunday night, Sheeran and Frontier Touring had pizza delivered to the growing camp ground.